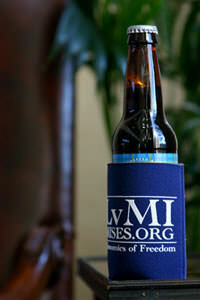 Can or bottle koozie with LvMI logo. Get them while they last! What is capitalism but the conquering of the cruelties of nature for the benefit of mankind? One of those cruelties is that cold things become room temperature even if we want them to stay cool. 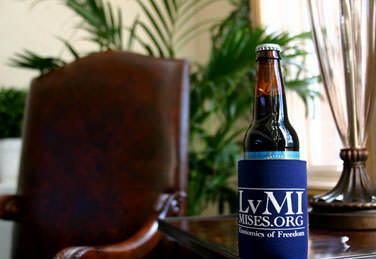 Think of a beer, for example. Americans like beer cold (no comment on other points of view on the matter). And yet the warmth of the hand has a warming effect even above room temperature. Hence, the hugger: the item that vastly prolongs the period of cold and thus increases human welfare for all who are fortunate enough to own one. The bottle “hugger,” then, may look like a round foam thing with a cloth wrapping, but it symbolizes much more. It demonstrates our determination to overcome the limits of what nature has given us and improve our lives through material innovation, and does so with an eye to convenience. And just as no man can make a pencil, no one man can make a beer hugger, for doing so requires a vast division of labor stretching from one end of the earth to the other. It requires materials that do not grow on trees and cannot be pulled up from the ground. They must be made with complex manufacturing processes that depend on property rights, the price system, competition, and relentless entrepreneurship and marketing. Will you accept what nature gives you or will you transform it? Consider too that this small treasure is made available to you at a very low price. How appropriate that this proclaims the name of the world’s leading institutional defender of human liberty: the liberty to drink, the liberty to innovate, and the liberty to fight back against the elements.